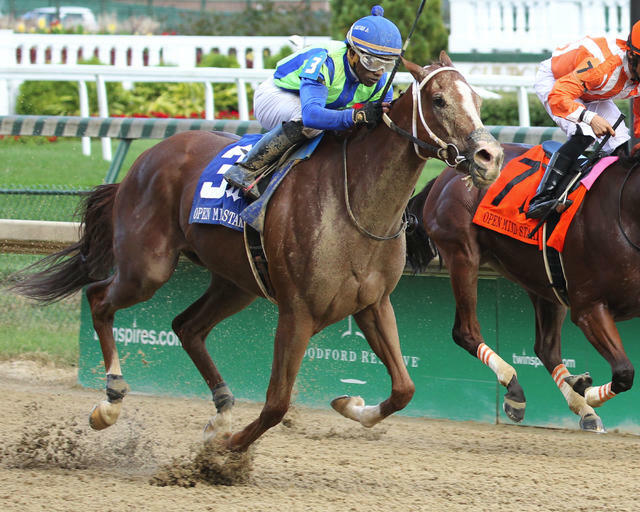 J. Kirk and Judy Robison’s Vertical Oak , sent to post as the even-money favorite, overcame early adversity and rallied late to run down Astrollinthepark in deep stretch to win Saturday’s 10th running of the $100,000 Open Mind (Listed) for fillies and mares at Churchill Downs by three-quarters of a length. Trained by Steve Asmussen and ridden by Ricardo Santana Jr., Vertical Oak clocked six furlongs on a fast track in 1:10.16 to give the trainer and jockey their third win together in the race. Previously, they won the Open Mind with Vuitton (2013) and Aireofdistinction (2014). Breaking from post position 3 in the field of seven fillies and mares, Vertical Oak was unexpectedly out-footed at the break as Courtmewithcarats shot to the front with Miss Kentucky tracking in second, Our Majesty trying to keep up and Astrollinthepark stalking from the outside. Vertical Oak was shuffled back to sixth as Miss Kentucky and Astrollinthepark closed to draw even with the leader on the far turn, who clocked an opening furlong in :21.74. After a half-mile in :45.70, Astrollinthepark spurted clear at the top of the stretch but Vertical Oak, who swung to the outside to commence a late run, rolled in the lane to just get up inside the final 100 yards. The victory was worth $60,760 and increased Vertical Oak’s earnings to $630,030 with a record of 7-3-3 from 18 starts. Vertical Oak is a Kentucky-bred daughter of Giant Oak out of the Pollard’s Vision mare Vertical Vision, and was bred by Millennium Farms. Vertical Oak rewarded her backers with mutuels of $4.20, $2.60 and $2.20. Astrollinthepark, ridden by Gabriel Saez, returned $3.20 and $2.80 as the 2-1 second betting choice with 15-1 outsider P Boo finishing third 4 ¼ lengths back under Jack Gilligan and paying $5 to show. It was another neck back to Thirteen Songs, who was followed in order by Courtmewithcarats, 3-1 third betting choice Miss Kentucky and Our Majesty. This was Vertical Oak’s fifth career stakes win. Her most notable triumph came in last year’s Prioress (Grade II) at Saratoga. In her most recent start, Vertical Oak finished second to Finley’sluckycharm in Saratoga’s Honorable Miss (GII) on July 25.